Win a $75 Gift Certificate to Redhead Piano Bar! Congratulations to Jen Bogardus on winning our twenty-ninth High Five Giveaway and thank you to all who entered. 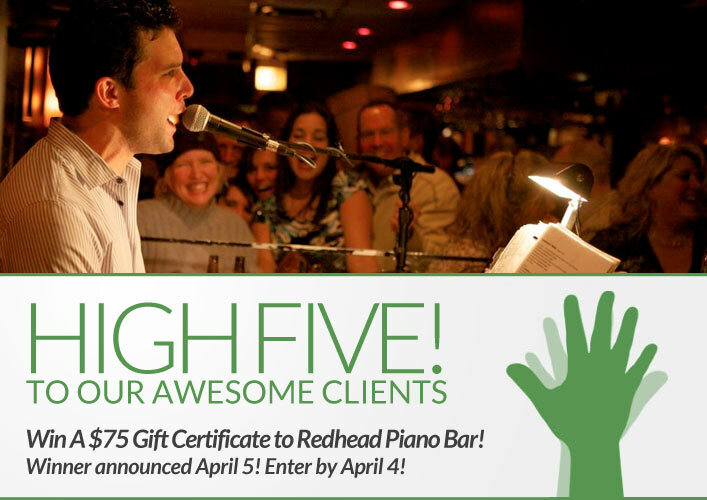 Our next High Five Giveaway is for a $75 gift certificate to Redhead Piano Bar. for fantastic upbeat music, lively conversation and meeting people. The upscale Redhead attracts clientele from the suburbs to Lincoln Park, the Gold Coast to Wrigleyville, as well as conventioneers and visitors to Chicago. Surround yourself in an exciting yet comfortable setting and take a walk down memory lane. The walls, lined with sheet music and famous movie stars of yesteryear, give you the feeling The Redhead has been here for fifty years. The ambiance creates an atmosphere of congeniality and warmth, reminiscent of Chicago true elegant nightlife. Redhead Piano Bar is located at 16 W. Ontario St, Chicago, IL. Visit their website at www.theredheadpianobar.com or call them at 312.640.1000 for more information. What is the name of Aveda’s curl-enhancing hair product line? Hint: See the title of the first video in our latest blog post for the answer! Now, just add a comment to this post with the right answer to be eligible to win! The winner will be announced on Friday, April 5. Entries must be received by midnight on Thursday, April 4. All individuals 21 and older are eligible, whether you are a client of XEX or not. Must be able to pick up the gift certificate at XEX, 35 West Wacker Drive, Chicago. Leaving a comment opts you in for the XEX email list, which is sent out 1-2 times per month. You may unsubscribe at any time.